Four and a half days. That was all. And some of that time must be spent sleeping. 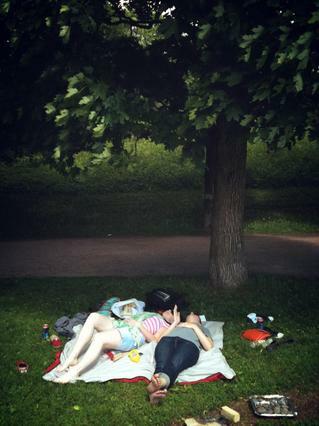 Sleeping instead of laughing, embracing, catching-up. Three times Audrey counted it. Four and a half days. And tomorrow her guests would arrive. I'm being dramatic, and I'm cheating a little, too. 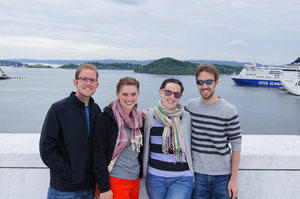 There's nothing terrible about having one's best friends in Oslo for four and a half days, except that it's less than five and a half or six and a half days. I'm stealing O. Henry's drama to make you understand, dear reader, how much I worried that four and a half days wouldn't be enough. One hundred and eight hours. Selfishly, I wanted a full week, but four and a half days would have to do. There was clearly nothing left to do but flop down on the shabby little couch and howl. I did the latter. And then planned, planned, planned all the stuff we would do, the places we would go, and the people we would see during those 108 hours. As it turned out, I needn't have worried. 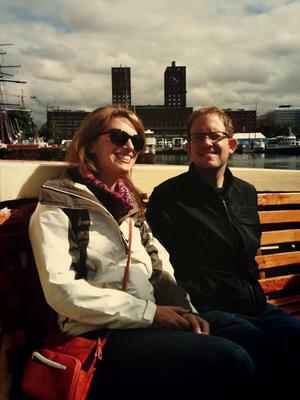 Life may well be made up of "sobs, sniffles, and smiles, with sniffles predominating," but smiles certainly held their own while Cindy and Brad were in Oslo with us. At left, you'll see what we wound up doing for the majority of that time. Besiding. Morning, noon, night (or what passes for night during summer in Norway), we were beside one another. At meals. Playing games. Exploring the city. I could reach out and touch my friend's elbow, feel her wrap her arm around my waist. Nothing went according to anybody's real plan. Brad and Cin were nursing colds. Jonathan ordered fish on his pizza. The tourist info office moved since last summer, so I had my guests break the law by riding public transportation before we actually bought the passes to do it! But all of it was done besiding. Which made it perfect. 1. 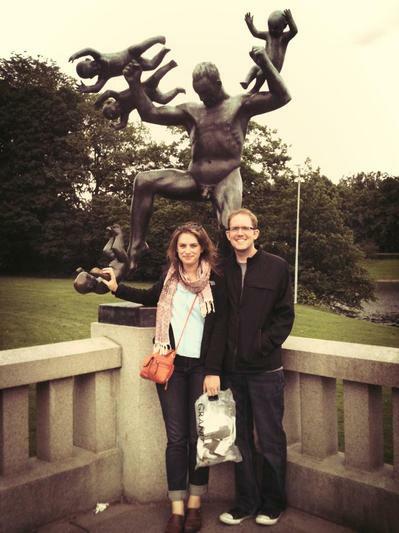 Spend an afternoon at Vigelandsparken posing with the statues. Better yet, stand back and watch quietly as group after group of other, dorkier tourists does this. Enjoy their ridiculousness. Feel unbelievably cool until you fail to resist the urge to touch the rubbed-shining fist of Angry Baby. Ponder the clusters of bulky nudes and wonder about Gustav Vigeland's frame of mind. Hear stories about Gustav's slightly weirder younger brother, Emmanuel. Wonder whether both men had mommy issues. Laugh anyway. 2. 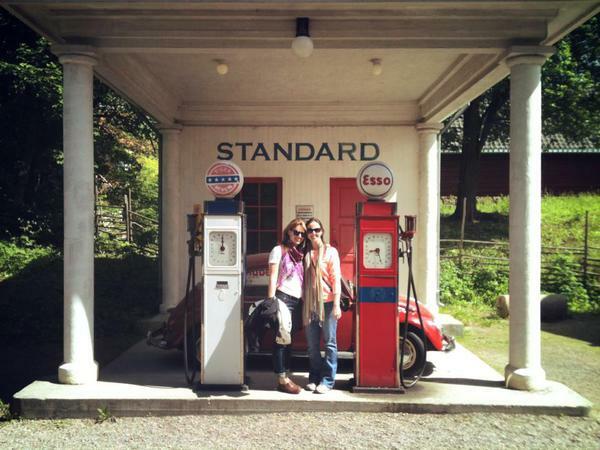 Take the ferry from Aker Brygge to Bygdøy Peninsula to visit a couple of museums. You'll think you can cram all of them into one big museum day, but you can't. Don't try. 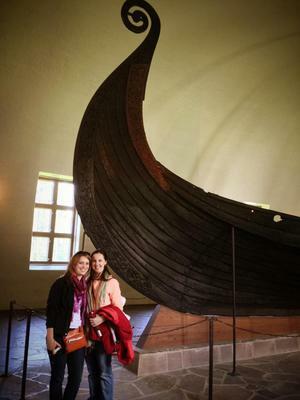 Pick the Viking Ship Museum because, let's face it, Norway is known for, like, two things worldwide. Vikings and their curly-prowed boats are one of them. Enter the small museum just in front of three tour groups. Read about the men and women who were buried in these ships and pretend you can stomach the numbers of horses, cows, dogs, and possibly human servants who were interred with them. It was a long time ago, all that violent injustice. Focus on a class of seven-year-old blonde children on a field trip, decked out in cardboard shields, plastic swords and duct tape Viking helmets. Aren't they cute? Tow-headed and pale and only moments away from smacking each other in the face with their makeshift weapons. Possibly the actual descendants of Vikings. 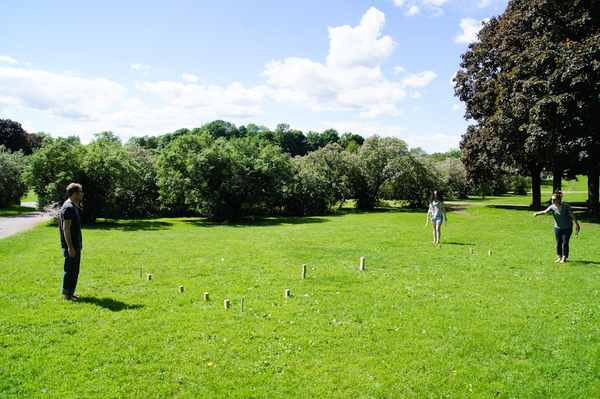 Move on to the Folk Museum and its open air exhibit. Trust your hostess when she says you can skip the interior exhibits on the toys of ancient Viking children. Buy ice cream at the cafe and begin your trek. Gape at the stave church and don't touch the wet paint. Ask questions about the dozens of grass-roofed buildings and get answers from the traditionally-costumed docents. 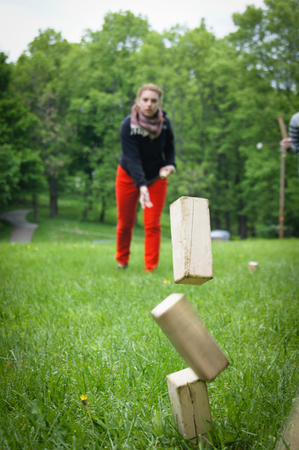 Don't fret when it turns out that several fun things are only available on weekends. Take your friend's word for it when she walks you up to an empty pig pen and describes the monstrous sow you can't see because it's Wednesday. Walk into the centuries-old buildings and purse your lips and nod as though you're very impressed. How dark, how dank, how spare. But be genuinely delighted when a costumed fiddler sitting in the corner of one of these dark, sod-roofed houses offers to play for you. Feign embarrassment when your best friend calls out, "Freebird!" Really, you think she's hilarious. 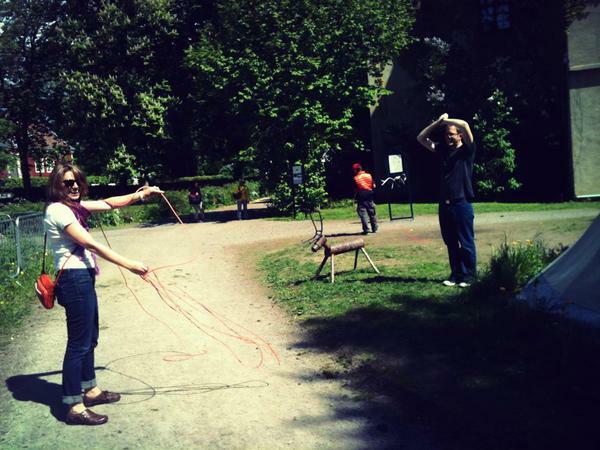 Don't exit the museum until you've flung a Sami lasso. Awkwardly, do this from the far side of a footpath trafficked by lots of other tourists. This is wholly unnecessary. You could just move the target back on the grassy patch near the teepee. It's not like it's a real reindeer. But if you worried about what people thought of you (or about accidentally roping an old person), it wouldn't be nearly as memorable, right? 3. 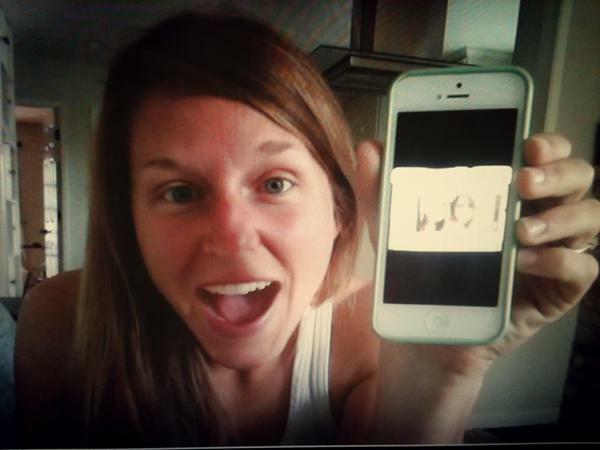 Make an afternoon appointment to Skype with your other very best bud in Santa Cruz. 4. 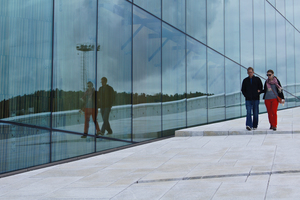 Walk up the bright, white planes of the Oslo Opera House. 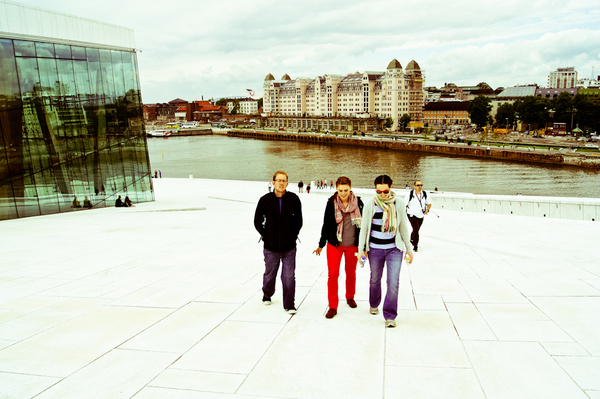 Remember, your Oslo friends will have made this same visit many, many times before. Wear orange pants. This will set your visit worlds apart. Be obliging when the orange-pants-thing makes your hosts take more photos than usual. Just keep smiling. The word for cheese in Norwegian is ost! 5. Because you just can't check-off too many art museums on a trip to Europe, follow your trusty guide to Oslo's National Gallery. Now, she'll swear there are paintings by all the masters, from France to Italy to Holland. She'll promise that the gallery itself is a work of art worth gazing upon. And she'll be wrong. Because it's randomly the 150th anniversary of Norwegian super-artist Edvard Munch, and the gallery will have been completely overhauled for this exhibit. Only Munch, and only half his career. Put your game face on and enter anyway. Suffer through room after room of Munch's tortured attempts to hang onto his own sanity by dominating a single motif for years at a time. 6. Play shuffleboard with a group of slightly tipsy Norwegians at The Dubliner in downtown Oslo. Win. This is important. To do any less would be to shame your hosts. If you lose, you will not be invited back. Finger fine linens and hearty, beautiful wool blankets. Heft intricate iron candle holders and bottle openers. Convert the prices in your head. Think you've miscalculated. That can't possibly be the price of a cheese slicer! Calculate it again. Look at your husband in shock and horror. When his expression matches your own, have him back away from all the souvenirs and into the arms of a waiting polar bear. A perfect cover. 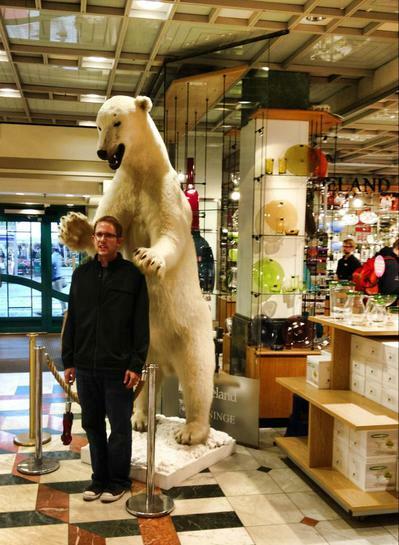 Now your fearfulness is plausibly caused by the bear, not by Norwegian sticker shock. 8. Visit an island the size of Livermore's Walmart for lunch. Enjoy the short ferry ride to the island even though you're famished. Once there, everyone in the group will realize at the same time that this dubiously-small island's lone cafe is closed for renovations. Shrug and smile. 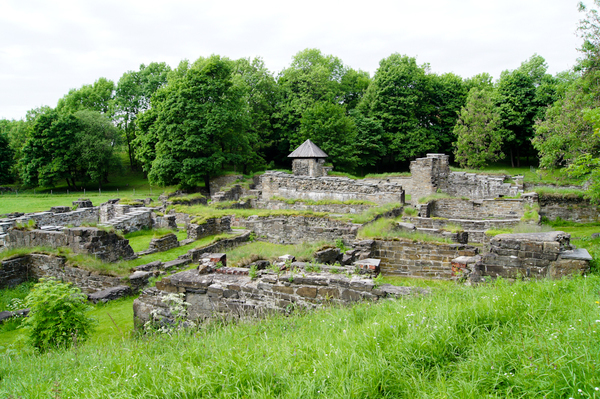 Then wander away to examine an ancient ruin. Your hosts will think you are overwhelmed by the aura of history, but really you just don't want them to hear your stomach growling. They'll be hungry, too, so they'll bust out a Norwegian lawn game to distract everyone until the ferry returns in an hour. Or perhaps you're playing for something far more important, something that will only matter if the boat doesn't come back, something Donner Pass-esque. Shudder. Oh, and when your ordinarily-athletic friend can't seem to hit the broad side of a barn with her klubbs, chalk it up to low blood sugar. She's actually awesome. 9. 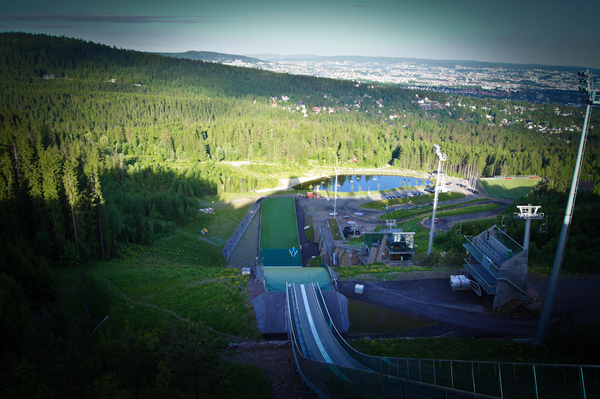 Squeeze both Frognerseteren and Holmenkollen into the same evening. 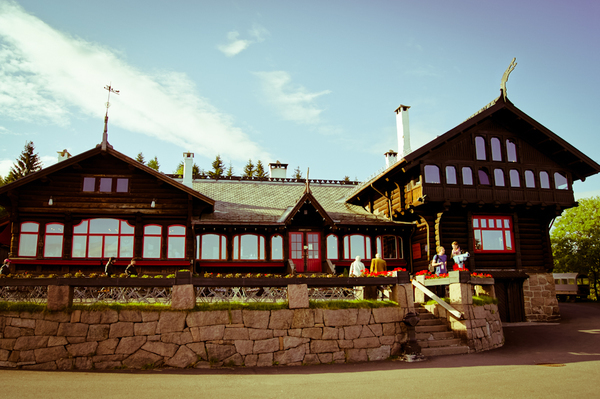 Take the metro up to Frognerseteren for dinner. Go to the fancy restaurant, Finstua, rather than the cafeteria on the other side. Even though you are immediately seated in an empty dining room, which makes your regular conversation with your friends seem both loud and immature. Even though each dish is served with the kind of rich, dark sauce that will absolutely splatter on your clothes. Point and laugh when your friend's prawns arrive with eyes big enough to guilt her from the plate. Ignore the lurking waiter. Eat until you're full. 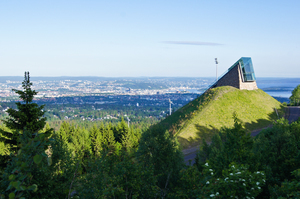 Then walk off the calories by heading downhill to Holmenkollen. 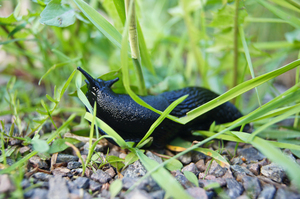 Take special care to avoid the numerous, shiny, black slugs that pepper the path. Your friend will point each and every one out to you as you go, as though you are three years old and you need this kind of mothering. She's thirty. Just go with it. Ride the spontaneity wave out to the smaller ski jump before you get to Holmenkollen because you'll get to climb the stairs there! Even if you actually only want to see the big jump, roll with it. Get super excited for real when the four of you happen to walk onto the jump at the same moment that two men in bat-suits are gearing up to fly down the thing. In the middle of summer. What?! Summer ski jumping. Apparently that goes on up here, and your hosts will be just as surprised as you are. Make the memory. Be grateful nobody faceplants while you're watching. Continue on down to Holmenkollen, but be underwhelmed since the losers down there are merely practicing biathlon. 10. 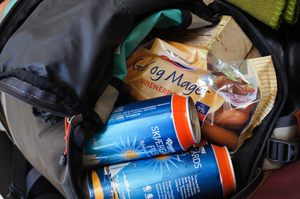 Call off all touristy plans on your last full day in favor of sommerøl, pølse med lompe, and utter relaxation. This is the true Oslo summer experience anyway. Days that begin at 3am and end close to midnight. Light, carbonated beer and hotdogs wrapped in potato tortillas. Grass clippings. Laziness. Marvel at how ordinary it feels to tease your friend's husband when he almost lights lunch on fire, or to talk aimlessly about life and the future. But when the future comes up, keep it blurry. Don't ask your friend when she's moving home to California. Clarity would upset this blissful afternoon. Reminisce instead about that one summer that the four of you spent as next door neighbors. How easy that was. How fine. Bring it up so you can both laugh about how your other friend in Santa Cruz is the one who always wanted you to live near one another when you grew up. When the three of you grew up. Of course, the growing up has already happened. You are 30, 29, and 28. All three of you are married. You have careers. You have hobbies. Your passports carry multiple stamps. And the truth is that you may never live close to one another again. Before this reality and its emotions can set in, an elderly stranger will wander up and ask how to play the game. Watch your friends rise and demonstrate it for him. 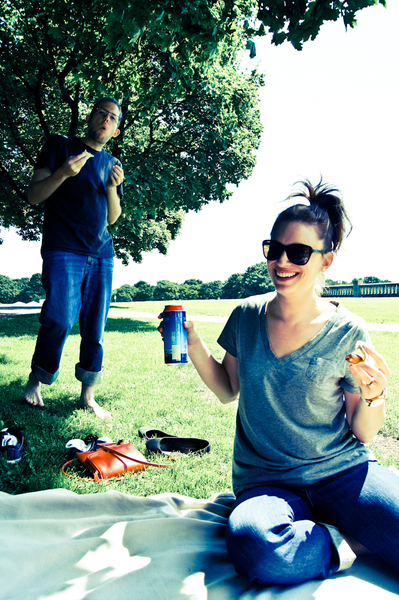 Then stand up, brush the grass and dampness from your jeans, and join in. There may only be hours until you leave, but don't worry. They'll seem to last longer if you just fill them with the kind of besideness which glues your four hearts together. 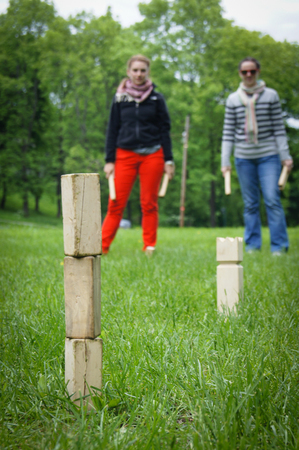 We had friends out last summer, too, including Amy (Santa Cruz friend) and her hubby, and they got a shoutout in Kubb: A Scandinavian War Game .